Dieser Anwendungsbericht beschreibt die Transfektion von A7 retinalen Astrozyten mit gWiz™GFP (green fluorescence protein) Reporter Plasmid und dem K2® Transfection System. Nach 48h beträgt die Transfektionseffizienz bis zu 40% bei einer Viabilität der Zellen von 70 bis 90%. To determine the most optimal K2® formulation for the transfection of A7 retinal astrocytes seeded with different population by evaluating its transfection efficiency and toxicity after 48 hours. A7 rat astrocyte, an immortalized astrocyte cell line was cultured with DMEM/High Glucose media supplemented with 10% fetal bovine serum and 1% penicillin/streptomycin (complete media) in T75 cell culture treated flask until 70% confluency. Cells were trypsinized using TrypLE Express and appropriate number of cells (25,000, 50,000, or 100,000 cells) were seeded into each well of either 12-well (for 50,000 and 100,000 cell seeding density) or 24-well (for 25,000 cell seeding density) tissue culture treated plates supplemented with 1mL of complete media . The plates were incubated in a 37°C incubator with 5% CO2 overnight prior to transfection. 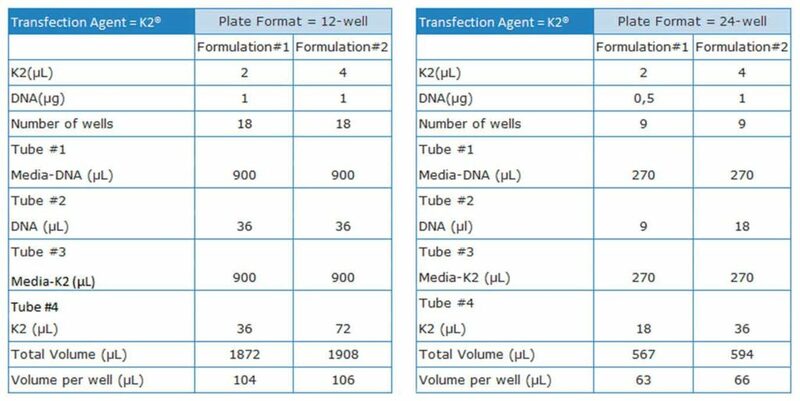 Two hours prior to transfection, 3.75µL of K2® Multiplier were added directly into each well containing cells and the plates were incubated at 37°C. In the meantime, K2® transfection particles were prepared according to manufacturer’s protocol. Please refer to Table 1 for specific quantities used. After two hours of K2® Multiplier incubation, the prepared K2® transfection particle was added into each well and incubated at 37°C for 48 hours. The specific dose volume varies between the formulations and seeding density as shown in Table 1. After 48 hours of transfection, cells were trypsinized using TrypLe™ Express and stained with 1mL of 1µM MitoTracker® Deep Red for 30 minutes at 37°C prior to flow cytometry evaluation. Transfection efficiency was determined based on GFP expression and the viability was evaluated based on MitoTracker® fluorescent emission. Figure 1 – Comparison between the transfection efficiency of A7 retinal astrocytes transfected with two different formulation ratios of K2® transfection reagents after 48 hours. Figure 2 – Comparison between the viability of A7 retinal astrocytes transfected with two different formulation ratios of K2® transfection reagent after 48 hours. Figure 3 – Confocal microscopic images of A7 astrocytes transfected with K2 transfection reagent (Formulation 2) after 48 hours. Green representing GFP expression and red representing the cellular membrane stained with CellMask™ Deep Red Plasma Membrane dye. K2® transfection system has demonstrated to be effective in the transfection of A7 cells and is currently being used in downstream experiments. H.M. Geller, M. Dubois-Dalcq, Antigenic and functional characterization of a rat central nervous system-derived cell line immortalized by a retroviral vector. J Cell Biol. 107 (1988) 1977-1986. M. Noble, K. Murray, Purified astrocytes promote the in vitro division of a bipotential glial progenitor cell. EMBO J. 3 (1984) 2243-2247.